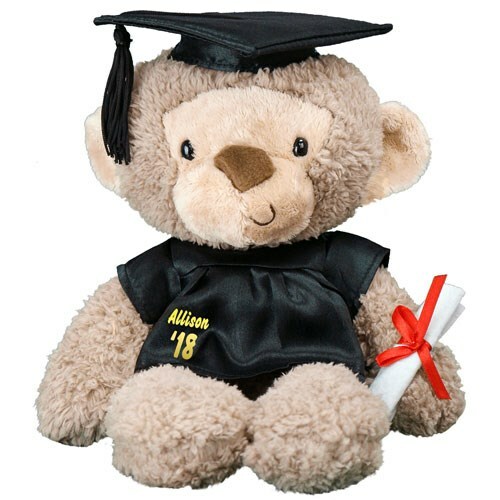 Graduation Cap and Gown Monkey - 14"
A Personalized Graduation Monkey makes an excellent gift choice for those who just graduated, whether it's kindergarten, middle school, high school or college. Our Graduation Fuzzy Monkey from Gund has plush tan fur, a plastic bean stuffed bottom and paw tips for extra weight. This custom Grad monkey is wearing a cute cap and gown outfit and is holding a diploma. He measures approx. 14" tall and includes personalization of any name and graduating year on his black graduation gown. Free gift wrapping and a free gift message are also included to create a thoughtful presentation. Additional Details Find the perfect way to help celebrate your graduate's achievements with a personalized plush gift from our Graduation selection!